Bast-1933 black tobiano. Sired by Pluto Lina (r), out of Batosta II (r). Zelda-1938 buckskin. Sired by 689 Neapolitano Ira (r), out of Zenta II (r). Cannot find full info on sire but do have picture of him though. Baroness-1958 black tobiano. Sired by Siglavy Trofetta XXXVIII (r), out of Bast. 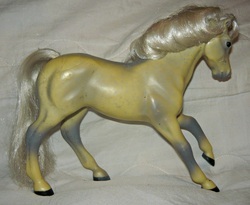 Zeppa-1963 buckskin. Sired by Conversano Pakra V (r), out of Zelda. Banshee-1983 black tobiano. Sired by Incitato X (r), out of Baroness. Zippa-1988 buckskin. Sired by Conversano II Erica (r), out of Zeppa. Syriana-1989 gray. Sired by Pluto II Dizana-r, out of Slavita-r. Bred by Celtic Song Stables and adopted from them. OF Grand Champion that's kind of yellowed due to age. Sorina-2001 gray (black base). Sired by Neapolitano Diamante, out of Syriana. Bred with the help of Pine Tree Stables. Ivana-2006 chestnut. Sired by 4231 Tulipan Titan (r), out of Maestoso Mithos (r). Bred in Romania and imported. Bandita-2008 black tobiano. Sired by Neapolitano XXIX-18 (r), out of Banshee. Bayatonya-2008 bay. Sired by Siglavy C. XIV-47 (r), out of Maestoso Madame (r). Bred in Romania and imported. Zandra-2010 buckskin roan. Sired by Maestoso Romida-8 (r), out of Zippa. Fatima-2011 chestnut. Sired by Caprioli Siglavy 4393 (r), our of Favory Hollo (r). Bred in Romania and Imported as a two year old. 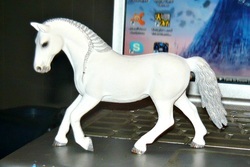 Falhma-2012 gray (chestnut base). Sired by Caprioli Siglavy 4393 (r0, our of Favory Hollo (r). Bred in Romania and Imported to the USA as a yearling. Zodiac-2013 buckskin. Sired by Tulipan Igorno, out of Zippa. Zephyra-2018 palomino. Sired by Maestoso Mercury, out of Zodiac.